A sweet romance in the style of Jacques Tati, with slapstick and gentle humour. Canadian Fiona arrives in Paris to help her Aunt Martha, who is threatened with being put into a retirement home. 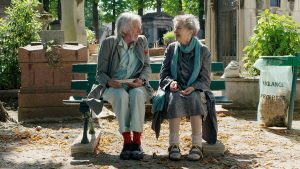 But Fiona gets lost and loses her luggage – so, the man who finds it is soon searching for her, while she’s searching for her missing aunt (French movie legend Riva, a delight in one of her last roles). Married directors/stars Gordon and Abel are “the two funniest clowns in cinema today”, delivering “more laughs than a nitrous oxide leak near a hyena compound” (Variety). Plus a BRIT School Showcase film, screened in partnership with the School’s Film & Media Production department. For this film we are showing From Thought to Foot (U) (3.21 mins), directed by Molly Hart and George O’Regan. Shows start at 2.30 & 7.30 pm, ticket prices £8.50 & £7.00 (concessions).